Home »Are Handmade and Antique Rugs Becoming Harder to Find? Are Handmade and Antique Rugs Becoming Harder to Find? In the past decade, Oriental rugs have been experiencing a market resurgence thanks to growing interest from younger generations and celebrities, whose homes are often decorated in beautiful handmade rugs, and are then featured in style and design publications. As a result, rugs have become more commonplace in retail centers and bargain outlets across the United States. But what people often don’t know is that these rugs are not only machine-made articles, but are often made of substandard materials that will only last a few months or a few years. For those who buy these types of rugs, durability is not always an issue. Sometimes purchasers are more interested in the look of a rug than its quality, and in this case, machine-made rugs many times fulfill this type of demand. However, there are far too many times when these rugs are misrepresented by their dealers, and even sold at a premium, without the buyer truly knowing if their rug is an antique – or at the very least, if it’s been made by the hands of an artist. While the market has been diluted to a degree by rugs produced in factories, there are still plenty of antique and handmade rugs available if you know where to look – and what to look for. In a recent article, we listed 5 things to look for in handmade rugs, which is a great guide to help you get started. 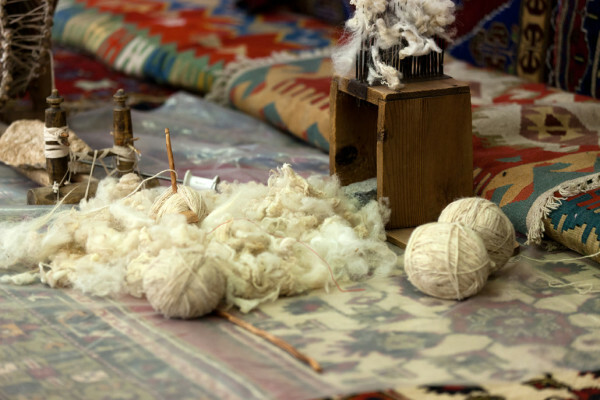 Yet, speaking to a specialist like those found at Ahdoot will give you an even greater insight into the importance and differences between handmade and machine-made rugs. What’s important about a rug being handmade? Well, there are many reasons, but most notably it means your rug will increase in value rather than becoming an item you throw away after a short time or when it falls apart. Handmade rugs, and particularly antique rugs, only increase in value as they age, whereas many modern rugs can be related to an automobile purchase, where their value begins dropping the moment they leave the store. Another reason for seeking out an antique rug is its exclusivity. With so many machine-made rugs being produced, and the majority being made in large batches, there is a good chance a rug you select online is already owned by thousands of other people. With handmade and antique rugs, however, you know you’re getting a one-of-a-kind work of art! In today’s world of mass production, this can really set you apart when it comes to home decorating, and it usually coincides with a greater understanding of the cultures these rugs come from as you learn about their places of origin. If you’re interested in learning more about the unique properties of Oriental, Persian and Turkish rugs, please visit our gallery or contact us online to speak with a rug specialist. We are always happy to help anyone interested in learning the profound differences that exist between handmade and machine-made rugs.